If you forgot page one or two, you may click here. 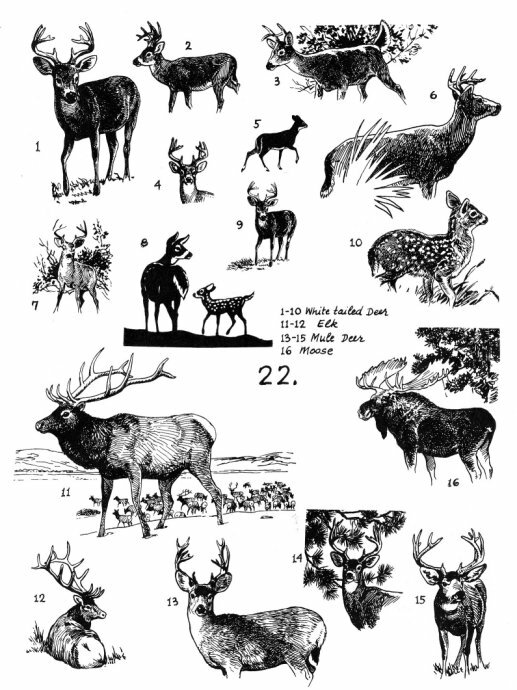 white-tailed deer, elk, moose, red deer, reindeer (caribou), fallow deer, roe deer and chital. horned animals such as antelope; these are in the same order as deer and may bear a superficial resemblance. and were widely so used in the past. like the family name "Cervidae", this is from Latin: cervus, "deer". 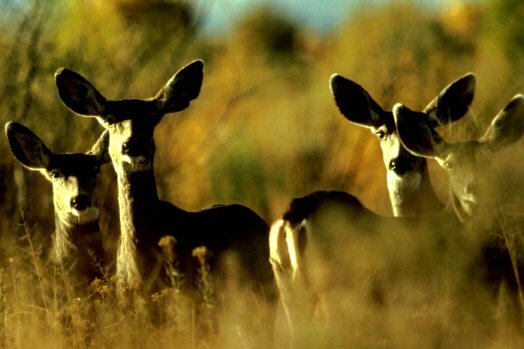 The mule deer, Odocoileus hemionus, is a deer indigenous to western North America, named for its large mule-like ears. immediately after the old antlers are shed. Shedding typically takes place in mid February, with variations occurring by locale. Although capable of running, mule deer often prefer to stot, with all four feet coming down together. another subspecies the black-tailed deer Odocoileus hemionus colombianus. Their name originates from Sitka, Alaska. 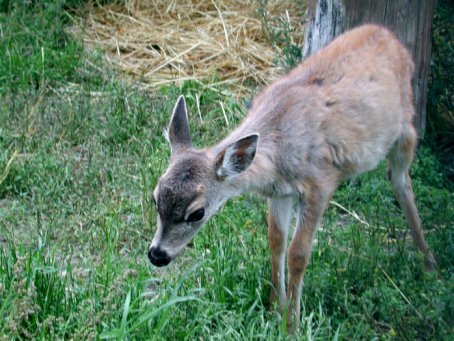 Sitka deer are characteristically smaller than other types of black-tailed deer. to have attained an age of 15. Sitka deer inhabit the coastal rainforests of northern British Columbia, Canada and southeastern Alaska, United States. and Haida Gwaii (Queen Charlotte Islands), British Columbia. weigh 2.73.6 kg. Bucks could weigh up to 5590 kg and does could weigh 3545 kg. them to "ruminate" (re-chew) their food, and contains bacteria specialized in breaking down cellulose. vaccinium, hemlock/cedar, and salmon berry bush. to 200 cm in length, and males 200 to 250 cm . Adults, on average, weigh 285 kg and range from 180 to 400 kg. but heavy zoo-kept specimens have weighed up to 650 kilograms. Their coat, a mix of black, gray, and brown, includes long guard hairs that almost reach the ground. 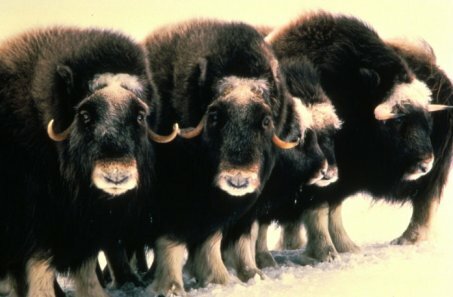 Rare "white muskoxen"
have been spotted in the Queen Maud Gulf Bird Sanctuary. 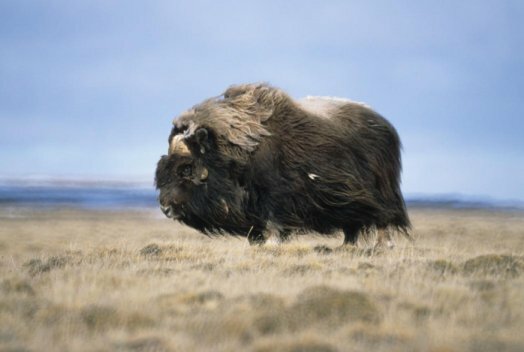 Muskoxen are occasionally domesticated for wool, meat and milk. The wool, is highly prized for its softness, length, and insulation value. Prices for yarn range between US$40 and $80 per 28 g.
subordinates from patches of grass during the winter. will casually kick a subordinate with its foreleg, something they do to cows during mating. A subordinate bull can change his status by charging a dominant bull. Scenic view of several pronghorn, Antilocapra americana, grazing, prairie and mountains in background. or simply antelope, as it closely resembles the true antelopes of the Old World. Adult males are 1.31.5 m long from nose to tail, stand 80105 cm high at the shoulder, and weigh 3670 kg. The females are the same heights as males but weigh 4150 kg . The feet have just two hooves, with no dewclaws. The body temperature is 38 °C. sheaths of the pronghorn are branched, each sheath possessing a forward-pointing tine (hence the name pronghorn). The horns of males are well developed. to the cheetah. It can, however, sustain high speeds longer than cheetahs. often affected by sheep ranchers' fences. However, they can be seen going under fences, sometimes at high speed. the fences, and/or installing a barb-less bottom wire. A Peninsular Pronghorn, Antilocapra americana peninsularis, National Bison Range located in Moiese, Montana. The Baja California Pronghorn or Peninsular Pronghorn, Antilocapra americana peninsularis, is a critically endangered pronghorn, endemic to Mexico. The wild population is estimated at 200. 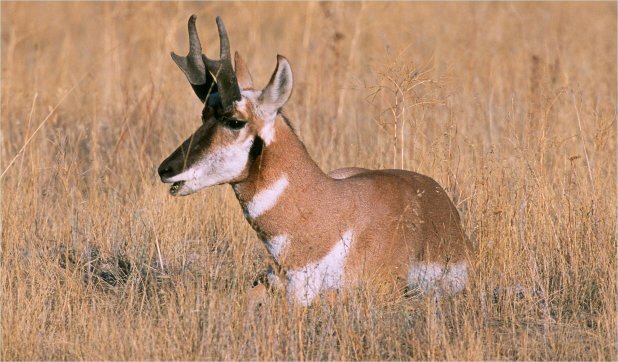 The Peninsular Pronghorn has been on the Endangered Species List since 1975.
mitochondrial DNA indicates they are a distinct species. New Zealand. Their great adaptability may threaten endemic species and ecosystems into which they have been introduced. over other males and attracts females. 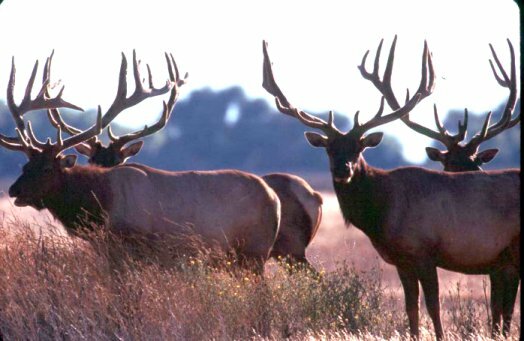 Elk are susceptible to a number of infectious diseases, some of which can be transmitted to livestock. Efforts to eliminate infectious diseases from elk populations, largely through vaccination, have had mixed success. and Rocky Mountain, Cervus canadensis nelsoni. been extinct for at least a century. males are called bulls, and females are called cows. In Asia, stag and hind, respectively, are sometimes used instead. colored rump patches and smaller tails. 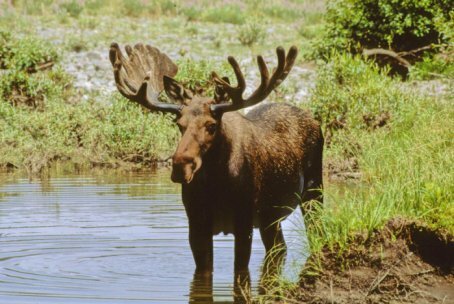 Moose are larger and darker than elk; bulls have distinctively different antlers. standing 1.5 metres at the shoulder and averaging 2.5 metres in length. Alaska, where the largest males are estimated to weigh up to 600 kilograms. growing, the antlers are covered with and protected by a soft layer of highly vascularised skin known as velvet. During the fall, elk grow a thicker coat of hair, which helps to insulate them during the winter. 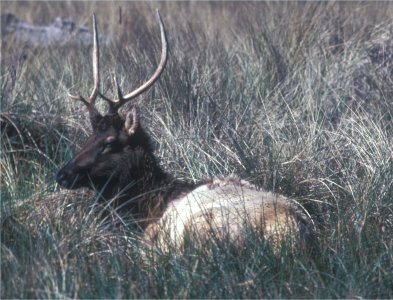 Males, females and calves of Siberian and North American elk all grow thin neck manes; female and young Manchurian and Alashan wapitis do not. 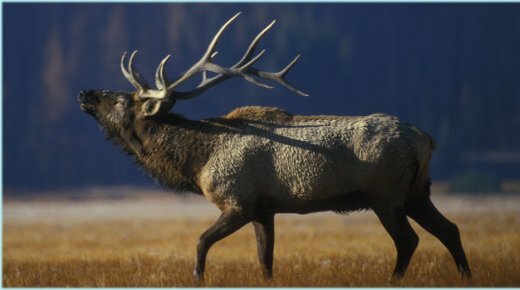 By early summer, the heavy winter coat has been shed, and elk are known to rub against trees and other objects to help remove hair from their bodies. All elk have small and clearly defined rump patches with short tails. of tree bark to eat. 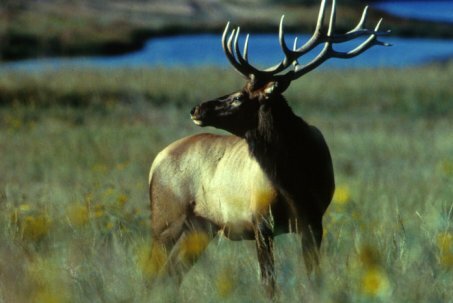 Roosevelt elk are generally non-migratory due to less seasonal variability of food sources. elk that reside in the northern sections of the GYE migrate to lower altitudes in Montana, mainly to the north and west. 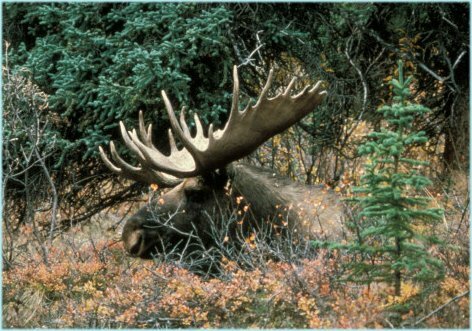 The moose (North America) or Eurasian elk (Europe), Alces alces, is the largest extant species in the deer family. terrestrial and aquatic vegetation. 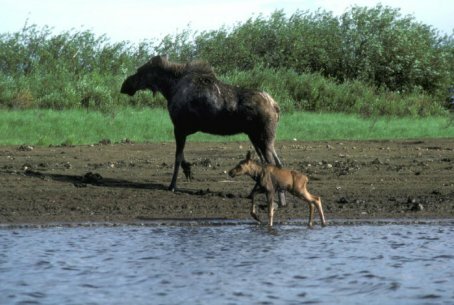 The most common moose predators are wolves, bears, and humans. autumn can lead to spectacular fights between males competing for the right to mate with a particular female. in western Colorado, and the state's moose population is now more than 1,000 with great potential to grow. absent since the early 18th century) plus reports of new dispersals to eastern New York, Rhode Island, and Connecticut. and somewhat less successfully on Anticosti Island in the Gulf of St. Lawrence. from just four that were introduced in the 1900s. United States: probably around 300,000, of which 2/3 are in Alaska. Description A male moose takes a rest in a field during a light rainshower. weighing 360 kilograms, can eat up to 32 kg of food per day. 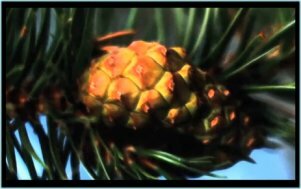 which aid in the eating of woody vegetation. of 1.8 m and averages 634.5 kg in males and 478 kg in females. was a bull shot at the Yukon River in September 1897 that weighed 820 kg and measured 2.35 m high at the shoulder. rarely gather in groups, there may be several in close proximity during the mating season. Mating occurs in September and October. The males are polygamous and will seek several females to breed with. larger, with the smaller bull retreating, or they may engage in battles, usually only involving the antlers. 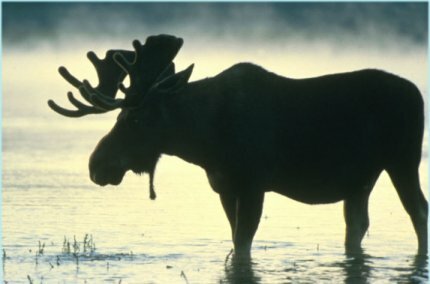 Female moose have an eight-month gestation period, usually bearing one calf, or twins if food is plentiful, in May or June. mother until just before the next young are born. 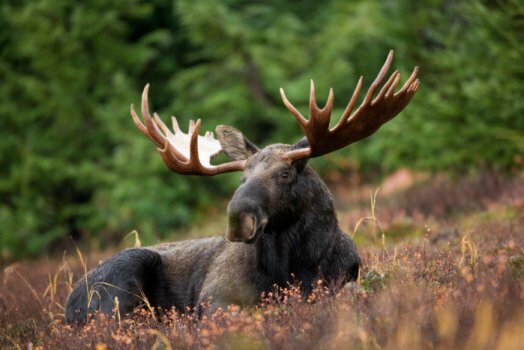 The life span of an average moose is about 1525 years. 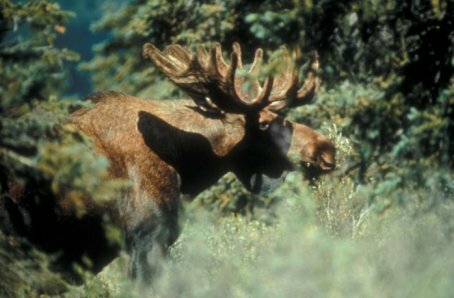 Read more about the moose in Eurasia, click here. and Serbia. In the Americas, it is the most widely distributed wild ungulate. British Columbia, including the Montana Valley and Foothill grasslands. more deciduous vegetation, and local caribou and moose populations. 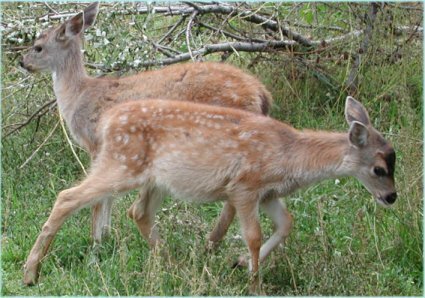 The deer's coat is a reddish-brown in the spring and summer and turns to a grey-brown throughout the fall and winter. 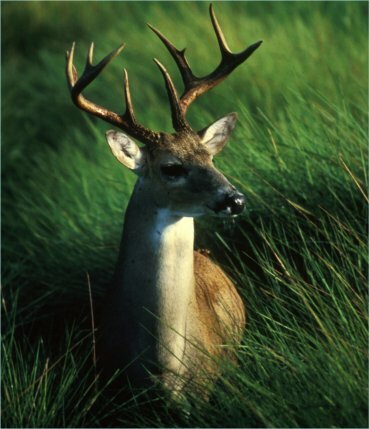 The white-tailed deer is highly variable in size.The average size seems to be larger further away from the Equator. excess of 160 kg have been recorded. 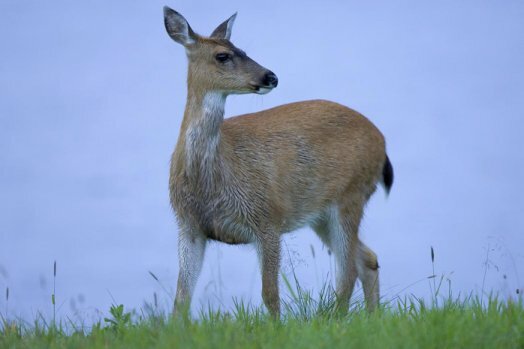 The female (doe) in North America usually weighs from 40 to 90 kg. and is 45.3 kg in adult females. 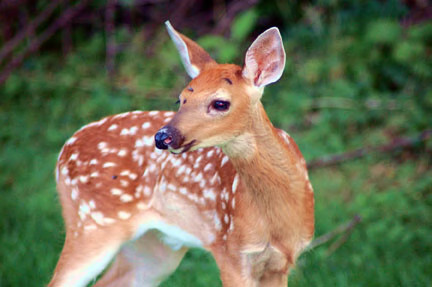 Deer have dichromatic (two-color) vision; humans have trichromatic vision. So what deer do not see are the oranges and reds that stand out so well to people. size and large tails. Also, there is a noticeable difference in size between male and female deer of the savannas. also have impressive antlers, considering their size. availability of food sources. They will also eat hay, grass, white clover, and other food that they can find in a farm yard. 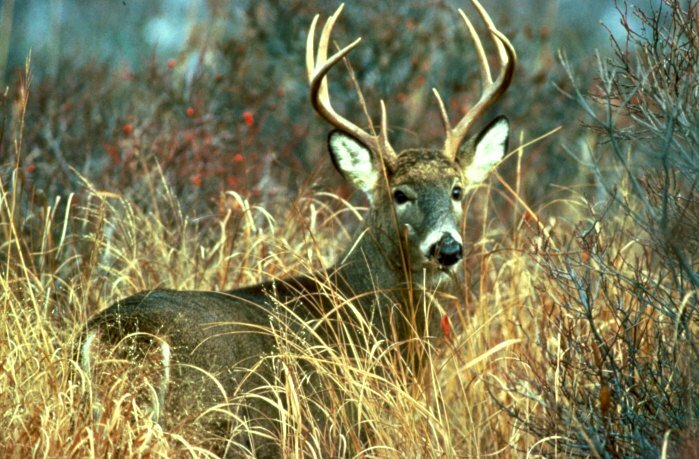 Whitetail deer have been known to opportunistically feed on nesting songbirds, field mice, and birds trapped in Mist nets. cover. 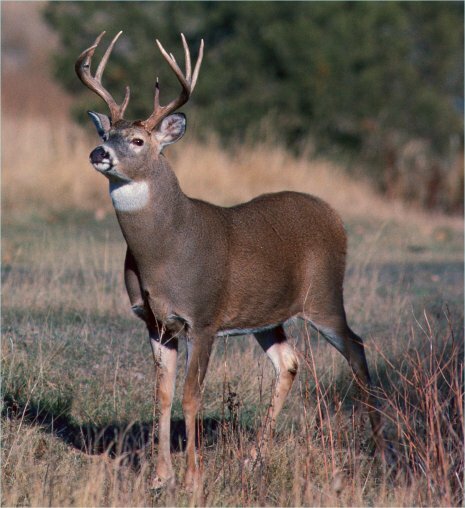 The Whitetail stomach hosts a complex set of bacteria that change as the deer's diet changes through the seasons. If the bacteria necessary for digestion of a particular food (e.g., hay) are absent it will not be digested. natural predators of adult deer. 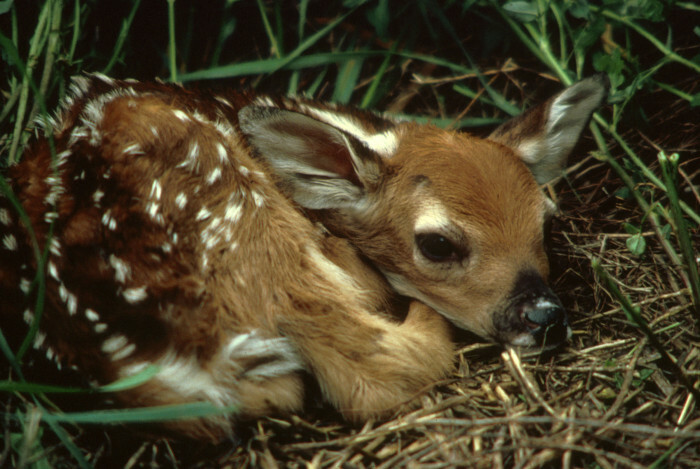 Bobcats, lynxes, bears, wolverines and packs of coyotes usually will prey on deer fawns. (only the coyote remains widespread) is believed to be a factor in the overpopulation issues with this species. may also rarely prey on deer fawns). 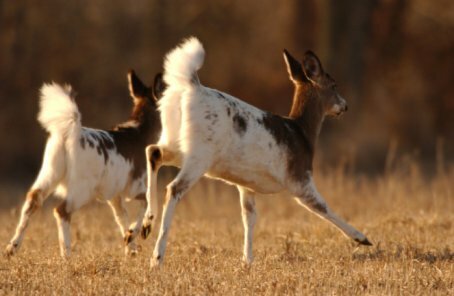 Piebald deer running, Shepherdstown, West Virginia. and short lower jaws. 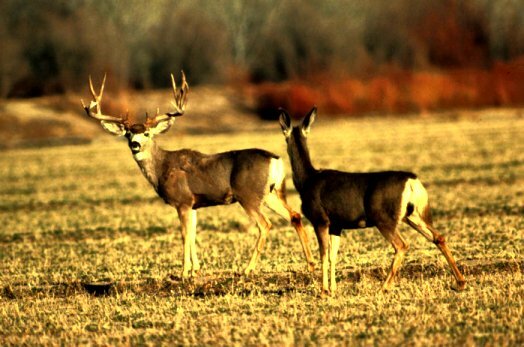 This genetic condition is rare with typically less than one percent of white-tailed deer being affected. 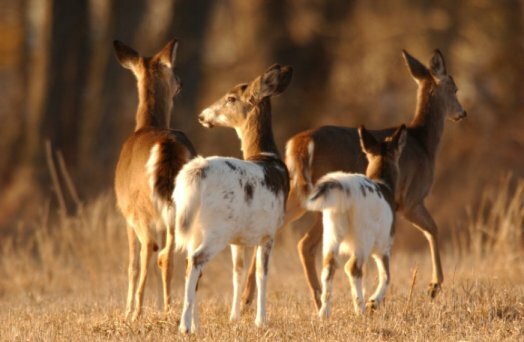 Herd of deer, two of which are considered piebald due to their large, white markings. the deer population in the area now known as the Conservation Area of the former Seneca Army Depot. 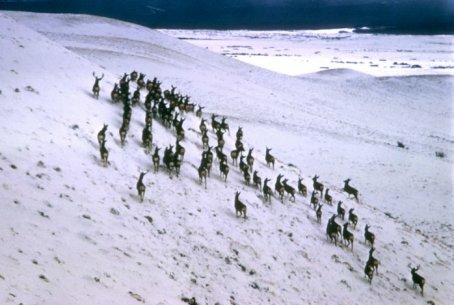 The U.S. Army gave the white deer protection while managing the normal colored deer through hunting. Young red deer fawn, Odocoileus virginianus, at John Heinz National Wildlife Refuge, PA.
That brings us to the end of page 3 of this North American Wildlife tour. but you may try page four right now. They are all in public domain.